Visit the Fortaleza Tourist Attractions! Ponte dos Ingleses. The English Bridge on Praia de Iracema at the end of Rua dos Cariris. The most visited Fortaleza tourist attraction wa built in December 1902. The best place to watch the beautiful sunsets in the city. A small art gallery and a marine observatory are located on the bridge where dolphins can be seen especially in the mornings. Feira de Artesanato da Avenida Beira Mar. Handicrafts Fair on Avenida Beira Mar in front of the Oasis Atlântico and Praiano Hotel Meireles, opens every day from 3 P.M to 11 P.M. Located on the sidewalk of the Beira Mar is one of the most popular places in Fortaleza to visit, with 626 booths and vendors selling clothing, lace, typical foods, sand bottles, paintings, embroidery, hammocks, nets, clay objects and other handicrafts. There you can see the local artists and craftsmen working on their products as well. Estátua de Iracema Guardia. 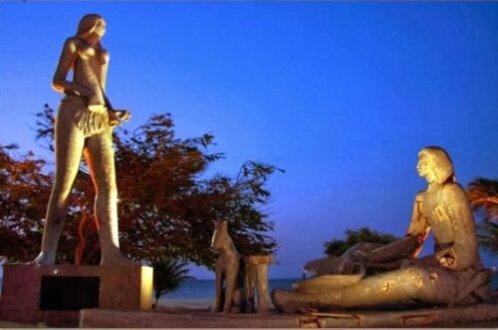 The Iracema Guardia Statue is located on Avenida Beira Mar, Iracema Beach, Fortaleza-Ceará. Inaugurated in 1996 by the artist Zenon Barreto is considered one of Fortaleza's main tourist attractions. The statue of a native Indian in a warlike stance holding a bow and looking out to sea. After vandals completley destroyed it the statue was restored by the city in 2012. 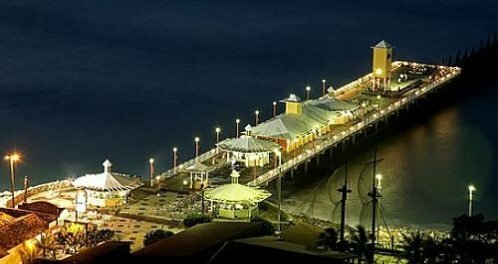 The Principal Fortaleza Tourist Attractions! Mercado Central. Central Market on Rua Alberto Nepomuceno, 199 betewween Iracema Beach and the center of Fortaleza opens from Monday through Friday from 8 to 18h; Saturday until 5 P.M; Sunday until noon. Origionaly was designed for the fruit and vegetable market. In 1931 with a space of more than 1,200 square meters and 4 floors now has more than 500 shops that also include handicraftts. Today you will find almost everything at the lowest prices from leather goods, sandals, hats, handbags, purses, lace and embroidery, clothing, bedding linens, table and bath items, T-shirts, 18 carat gold jewelry, and costume jewelry. Typical drinks and local food are also for sale. Among them liquors, cachaças, pepper sauces, cashew nuts and candies. It has ramps along with the stairs and an elevator and so it is easy and pleasant to stroll around. You can bargain with the vendors for the best price! Centro Dragão do Mar de Arte e Cultura. Rua Dragão do Mar, 81, Praia de Iracema (near the Public Library and Avenida Monsenhor Tabosa). Open from Tuesday to Friday, from 8:30 A.M to 9:30 P.M; Saturday and Sunday, from 2:30 P.M. to 9:30 P.M.. Closed Mondays. The largest cultural center in Fortaleza and the state of Ceará was inaugurated in August 1998. A majestic architectural complex occupying an area of 30,000 square meters. Attractions include the Ceará Culture Memorial, art museum, cinema-theater (with 267 seats), amphitheater (with 840 seats), auditorium (with 120 seats) and art workshops. In the second phase of Dragon of the Sea and already in operation a planetarium, library, bookstore, restaurant, cafeteria, snack bar and classrooms for courses in cinema, theater, design and dance ! On exhibit in the Centro Dragão do Mar de Arte e Cultura, the visitor finds a painel which displays the soul of Ceará. Composed of four segments - faith, inventiveness, life and joy. Also on exhibit "Brave Beauties of Ceará or the Unabashed World of Popular Culture" presenting the cultural history of the state of Ceara and its people through folk art, embroidery, paintings, woodcrafs and ceramics. The Museum of Art of Ceará has in the permanent collection works of two of Ceará's greatest artists: Raimundo Cela and Antônio Bandeira. The collections bring together techniques such as oil painting, ink and coal drawings, with a total of 16 works by Antônio Bandeira and 18 by Raimundo Cela. Fortaleza de Nossa Senhora de Assunção. Fortress of Our Lady of Asuncion (bears city name) on Avenida Humberto Nepomuceno, Centro de Fortaleza. 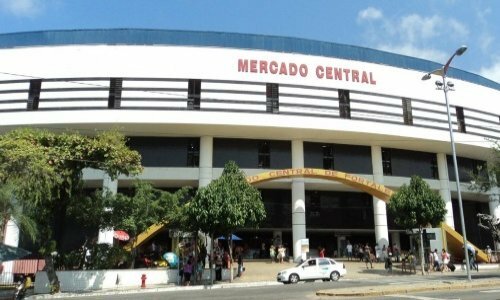 Stands in front of the Mercado Central open to visitors, from 8 A.M to 4 P.M. Built by Matias Beck in 1649, during the Dutch invasion - was christened Fort Schoonrnborch. Taken by the Portuguese six years later, when it received the current name - Fortaleza de Nossa Senhora de Assunção, patron of the city. Rebuilt in 1817 for the Tenth Military Region. The city bears its name Fortaleza (Fortress), which still holds the cell where Barbara de Alencar was held, the mother of the writer José de Alencar. Catedral Metropolitana. Metropolitan Cathedral,Praça da sé Centro de Fortaleza alongside the Central Market. In eclectic style, with a predominance of gothic elements was built between the years of 1937 and 1978. Inspired by the cathedral of Cologne Germanany. Includes two towers 75 meters high and holds up to 5 thousand people. Opened in 1978, it has beautiful stained glass windows and is considered one of Fortaleza's greatest historical and tourist attractions! Antiga Cadeia Pública. The old public prison on Rua Senador Pompeu, 350, Centro de Fortaleza. Open Monday through Friday from 8 A.M to 6 P.M Saturday 8 A.M to 2 P.M. One of the first public buildings to meet the modifications imposed by the Imperial Penitentiary Legislation. The works began in 1850 and completed in 1966. It has classic lines and clear and simple colonial shapes. Currently, it houses the State Tourism Center, with handicraft shops, the Museum of Minerals and the Museum of Popular Art and Culture. There are 104 booths that offer clothing, leather articles, wooden objects and other varieties of handicrafts and souvenirs. Museu do Ceará. Museum of Ceará. Rua São Paulo 51, General Tibúrcio Square, Centro (Senator Alencar Palace). Open from Wednesday to Friday, from 8:30 a.m. to 5:30 p.m. Saturday from 8:30 a.m. to 2:30 p.m. Sunday from 2:00 P.M. to 5:00 P.M. Senator Alencar's palace was completed in 1871 and throughout its history has housed entities such as the Provincial Assembly, the Liceu do Ceará, the Faculty of Law, the Regional Electoral Tribunal and the Ceará Academy of Letters, where until 1933 it housed the Historical Museum of Ceará and, in 1951, received the denomination Historical and Anthropological Museum of Ceará. Was restored and in 1990, when it was renamed Museu do Ceará. Exhibits consists of 5,830 pieces distributed into several collections: paleontology, armaria, painting, ethnography and indigenous anthropology, archaeological, porcelain, visual arts, furniture, objects of adornment, personal devotion, punishment / penitentiary, documents and rare books on the history Fortaleza Ceara. The museum underwent a major renovation in 1998, with a long-term exhibition "Terra da Luz e Ceará Moleque Que História é essa?" was climatized and Air conditioning between 27 and 28 degrees, and special lighting, recovery of parts, presentation of the "Fortaleza Liberta" painting and the cultural labyrinth, set up to tell the story of Ceará. Preservation of heritage exhibit which includes the library of Carlos Studart, with a collection of books related to literature. One of the most organized and interesting tourist spots for those interested in the history of Fortaleza Ceara! More interesting Fortaleza Tourist Attractions !! Praça General Tibúrcio: Between the streets Senador Madureira General Bezerril, São Paulo and Guilherme Rocha, in the Center of Fortaleza. Built in 1817, it was named after a Ceará general who participated in the Paraguayan War. The highlight is the bronze statues of the lions, brought from Paris at the beginning of this century. Together with the Igreja de Nossa Senhora do Rosário (Church of Our Lady of the Rosary), Palace of Light and the former Provincial Assembly, that together form an important architectural complex. Teatro José de Alencar. Praça José de Alencar Centro de Fortaleza. 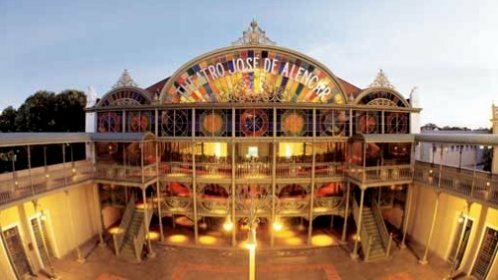 The José de Alencar Theater construction began in 1908 and was completed only two years later, in June 1910. Impassing the city with a facade in neoclassical style and art noveau features. Its body was built entirely of cast iron and steel, imported from Scotland. The wooden ceiling was painted by hand and in its center a vault with 97 lamps that illuminates the stage for plays, concerts and dance shows, which can be seen from one of its three levels. With a capacity for about 800 people, it was listed by Historical Heritage in 1964 because of its great artistic wealth and cultural importance..
Mausoleum President Monte Castelo Branco. Mausoleum President Monte Castelo Branco on Avenida Barão de Studart, 505, Aldeota. Open daily from 8 A.M to 7 P.M. Located in the Palácio da Abolição, former headquarters of the Palácio Estadual, it houses the remains of former president Humberto Castelo Branco, and his wife, Argentina Castelo Branco, as well as some personal objects and documents of the general. Dont miss our Fortaleza Tourist Atractions ! Estátua de Iracema. Avenida Beira (Statue of Iracema). Avenida Beira - Mar, Mucuripe beach. A tribute to the work of the Ceará writer José de Alencar, the statue of an Indian, with the arrow in hand looking out to sea. The Portuguese warrior, sitting in front of him, holding his son Moacir in his arms. The monument was erected on the pier of the port, where Iracema expected his love to return. Farol do Mucuripe (Mucuripe Lighthouse) on Avenida Vicente de Castro, Mucuripe. Open daily from 8 A.M. to 6 P.M. Erected in 1846, by slaves and dedicated to their princess Isabel. It remained in operation for 111 years, being decommissioned in 1957. In 1982, it underwent a process of restoration and was registered by the Municipal Historic Patrimony. It houses the Museum of Fortaleza, better known as the Museum of the Lighthouse. 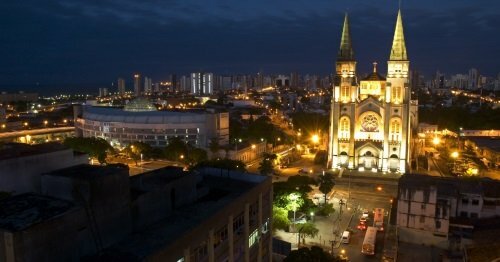 Reserve your Fortaleza City Tour - Fortaleza Tourist Attractions!